There was an air of excitement as I packed up and left the 100s of midges behind. My parents had travelled up with the caravan from East Sussex to be my support crew for 10 days and we arranged to meet at the Tan Hill Inn. Which meant, well, bliss. 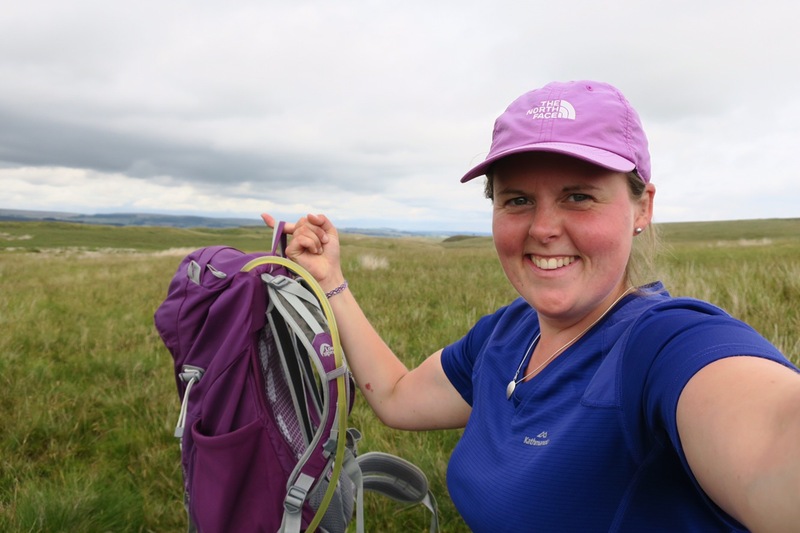 A super light day bag, no worries about accommodation, no thoughts about where my next meal would come from or how I might imaginatively cook it on my stove, and I’d put in a request for some extra clothes, a proper pillow and a nice fluffy towel – a respite from microfibre! 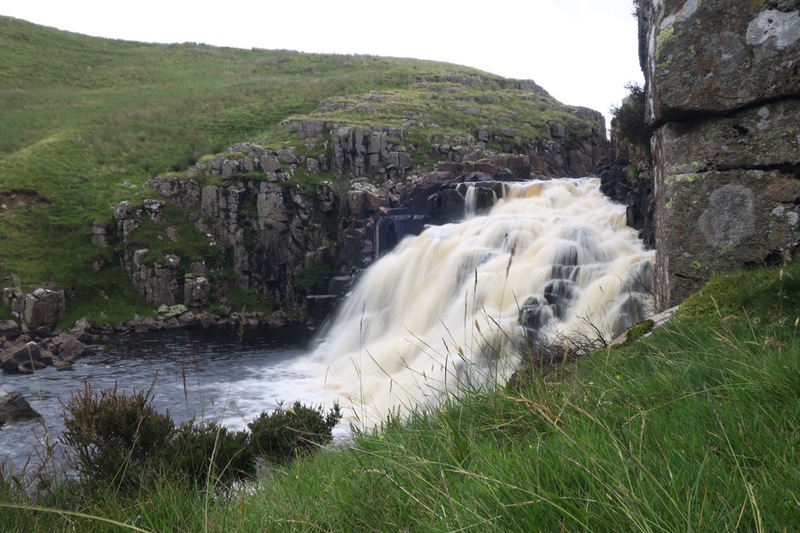 I opted to take a path that was not the Pennine Way – gasp – but seeing the Way unnecessarily climb and fall on the opposite side of the river I felt vindicated as I only had a gentle rise onto the moors. Once up there it rained on and off so I sheltered in a cow-‘ause for my lunch. With less than 5miles to go, I had to consciously slow myself down as I knew the earliest my parents would be able to get there was 4pm and I’d call them when I arrived to let them know I’d made it. 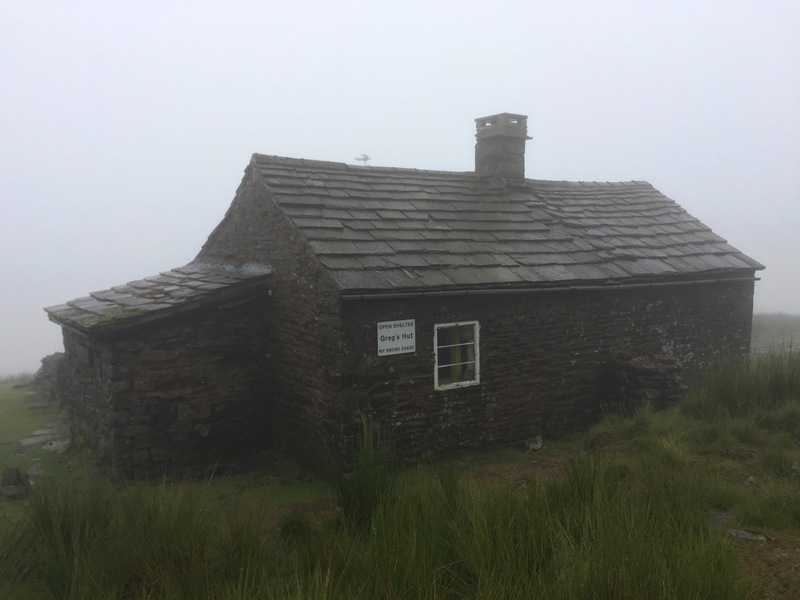 The inn – which at 530m is the highest in England and possibly one of the remotest – is a popular spot for walkers, cyclist and bikers as it offers camping, bunkhouse and B&B accommodation. Plus it remains open in the foulest weather even when they’ve been snowed in for weeks they still welcome visitors. As I reached for the door handle I spotted a handwritten sign stuck to the window which read; “Due to an issue with the water supply we have had to close, sorry for any inconvenience”. Well, I nearly cried, but the porch was open so I resigned myself to waiting there. Then a guy came over, unlocked the door and said; “we’ve taken pity on you, come on in and sit by the fire and dry yourself off!”. I was so grateful for the warmth but pushed my luck by asking if the hand pumps still worked and they did! I supped my beer and steamed by the fire as the staff ate their lunch and I gleaned more information about the issue. Then the landlady appeared and asked the staff to begin a deep clean – they may as well make the best of a bad situation. Meanwhile the phone was constantly going; the message had gone out and those with bookings were calling to find out more or just complain. Amidst the melee someone left the door unlocked and so customers kept letting themselves in – despite the sign; a group of 4, a couple, another 3, another couple. The landlady was sat by the door and welcomed each patron with a smile and the same line; “we are officially closed as we don’t have any water, so you can’t use the toilets and you can’t have tea or coffee. But if you’d like an effing drink, you can pour it your-effing-self or eff off!!”. So that is just what they did, they went behind the bar, found a glass and pulled their own pints. It was absolute joyous chaos and provided great entertainment whilst I waited for my parents to arrive. When they did, there were hugs and a few tears. I pulled us some drinks and we caught up. Then it was back to the campsite where I’d be pitched for 5 whole nights. After a very relaxing evening in the caravan, one of mum’s home-cooked lasagnas, a G&T and a glass of wine it was back to Tan Hill in the morning for the walk across Sleightholme Moor. With only a day pack I felt like I was flying, it was great! 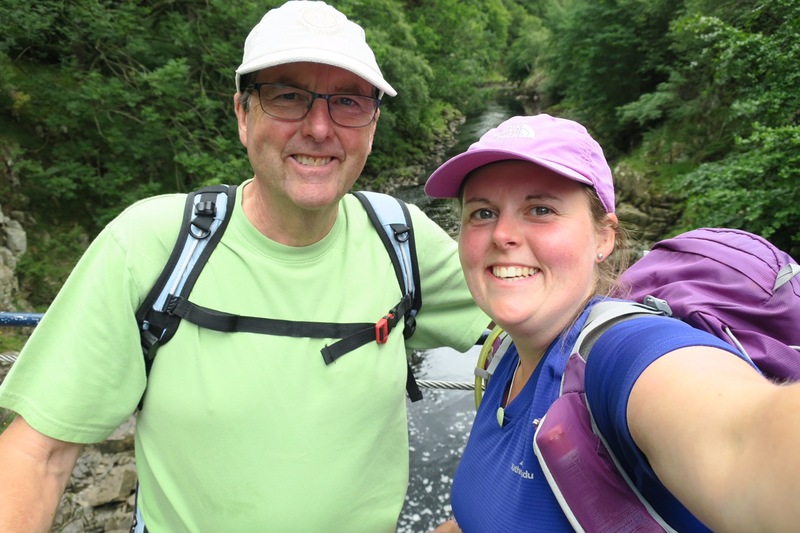 Somehow Allan – with a hand he pack – caught up with me, he was walking the Pennine Way as part of his PTSD therapy and raising money for a veteran’s charity having served in the army for 17yrs +. We walked and chatted, crossed under the busy A66 and continued across the moors. At a cairn I stopped for lunch and Allan decided that was him done for the day so he pitched his tent. Another couple of walkers caught up – John and John who I’d met in the Tan Hill the day before. Shortly before the arranged pick up point there were a couple of nature reserves. One was ‘Hannah’s Meadows’ named after Hannah Hauxwell who farmed there using such simple methods that rare flower species thrive and it is now designated an SSSI. I recommend the original documentary from the 1970s called ‘Too Long a Winter’ and its sequel ‘A Winter Too Many’ about her frugal life on the farm (both are on YouTube). 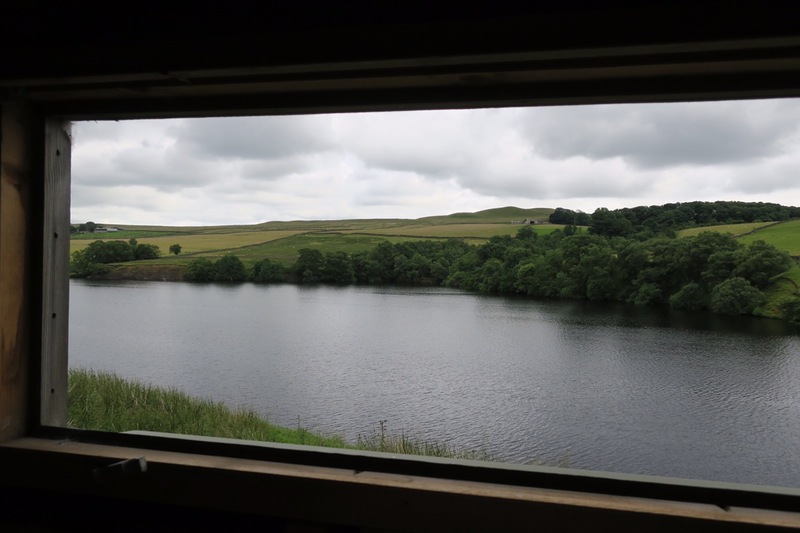 I had a peaceful moment in a hide looking over the reservoir; 2 oystercatchers, a heron, a gull and lots of sheep. In the evening dad cooked a BBQ and one of my best friends; Emma happened to be in Penrith for work and she was able to drive over for some of my dad’s charred sausages. 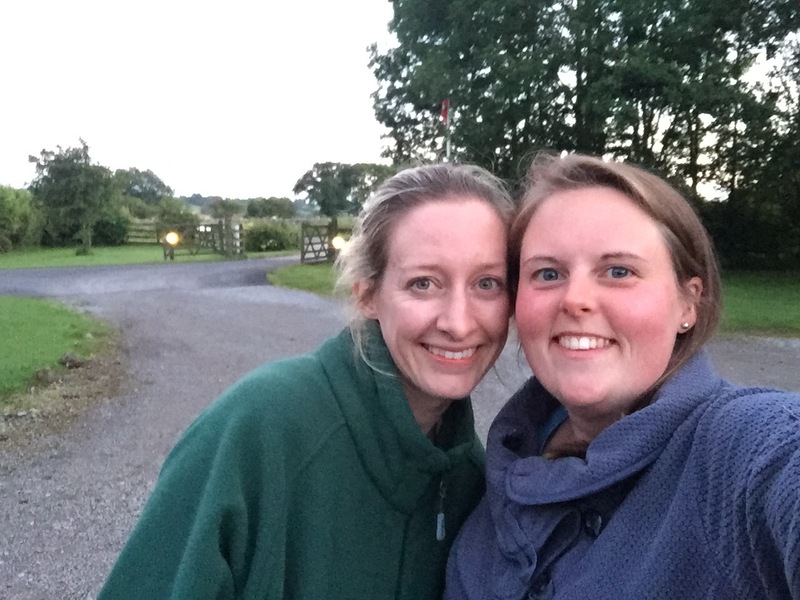 It was a great surprise and a bit of a shock to the system to suddenly be surrounded by friends and family – I’m not used to so much conversation and having to verbalise my thoughts. Today my dad was going to join me for a large part of the day but first I had to get up over a hill and down in to Middleton-in-Teesdale. The 2.5 miles took over the estimated hour because I had binoculars and so was distracted by the many birds plus I dropped my map and had to go back about 1/4mile to find it. I found my parents at the coffee shop and then me and dad waved goodbye to mum and set off along the Tees. It was a lovely walk along the dale through meadows and copses, plus it was perfect walking weather. 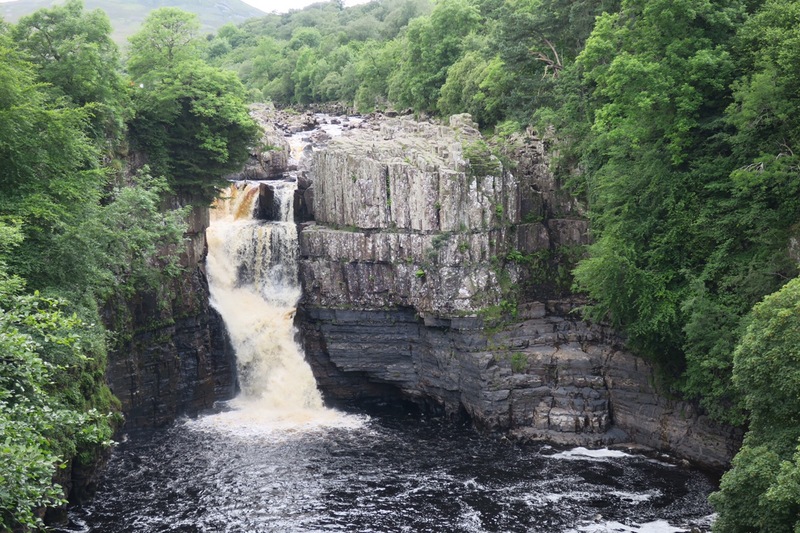 We passed by Low Force and High Force where there were many more walkers but out the other side of the attractions we were back to having the trail and the juniper trees (with gin berries) to ourselves. It was a short climb at the end of the day up to Langdon Beck YHA and dad was pleased to see mum and the car. He had now completed 0.7% of LEJOG but didn’t think he could tackle the remaining 99.3! Yesterday we had a day off and went to Richmond for some gear shopping and lunch. Then in the morning it was back to Langdon Beck for the walk over the Tees, along a beck to Cauldron Snout Waterfall (which you need to scramble up the side of so I was very glad for the small, light bag), then on to High Cup Nick and down to Dufton. I’d never heard of High Cup Nick before but I think it will stick in my memory forever. Coming from the south, you come from a narrow-ish river valley. As it opens up you walk across the plain and then wham! you’re stood at the top of a band of rock that surrounds this huge bowl-like feature with views to the Lake District. Absolutely stunning. Today I was going to reach 893m – higher than I’d been so far and higher than I would get for the rest of the trip – even in Scotland. I did a sun dance but unfortunately I must have been communicating with the low mist and cloud god. 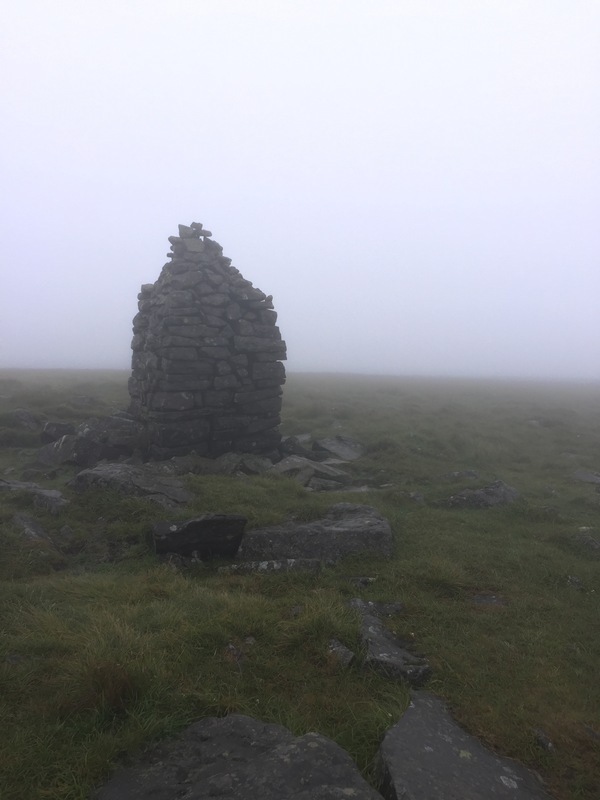 After an hour of ascending towards Green Fell I went into the cloud and could only see about 20-30m around me. 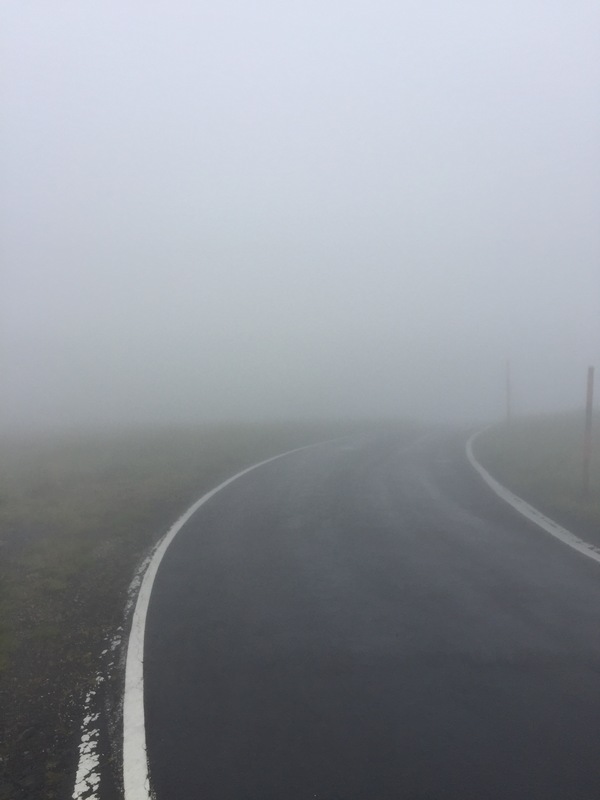 It stayed this way until an hour before reaching Garrigill when I descended out of the cloud. This weather made for some great photos…! I appreciated the use of Greg’s Hut as a respite from the wind and rain whilst I had my lunch. I expected to find other wayfarers settled in for the night having decided not to continue battling through the weather, but I had it to myself. The final 6.5miles down the old corpse road were grim and hard on the feet – again I was glad I didn’t have the full pack. Whilst I was out on the hills my parents moved base camp from Barnard Castle up to Bellingham. It was a special day today because I had arranged to meet Ronnie and Julie (see days 8 and 38) who were going to join me for half a day of walking. We met in Garrigill and the weather was much improved – perhaps my sun dance had got stuck in an outbox. 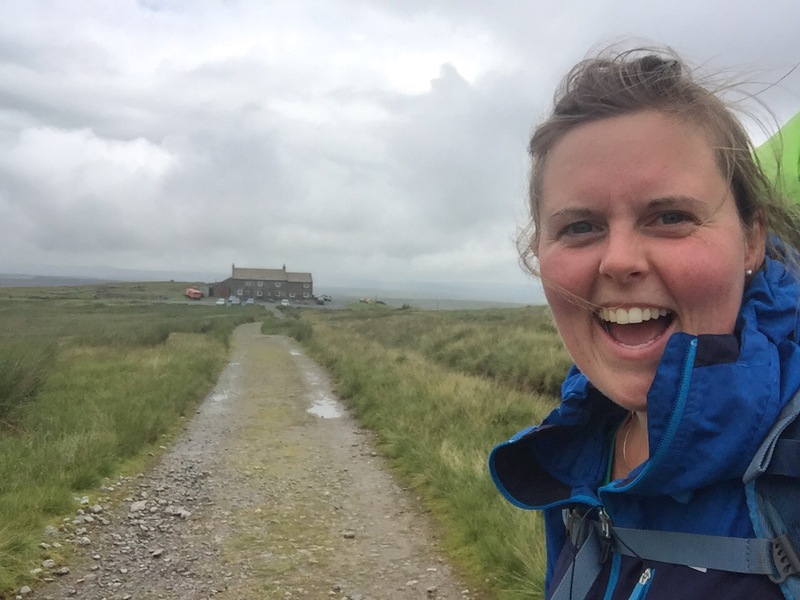 We walked the Pennine Way up to Alston where they bought me coffee and cake and then we continued along the railway line, which was not all disused – it had steam trains running along part of it – and it was unlike many other railways lines. It was not completely straight, flat, tarmacked and enclosed, instead it was refreshingly open with nice views. We talked for hours, sharing tales of the places we had stayed. 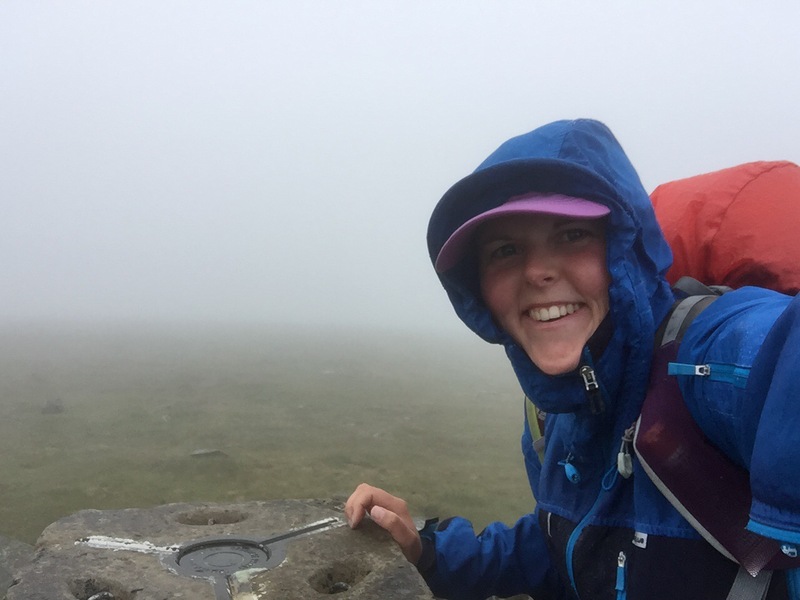 Our differing experiences of the same places were usually dependent on the weather at the time. 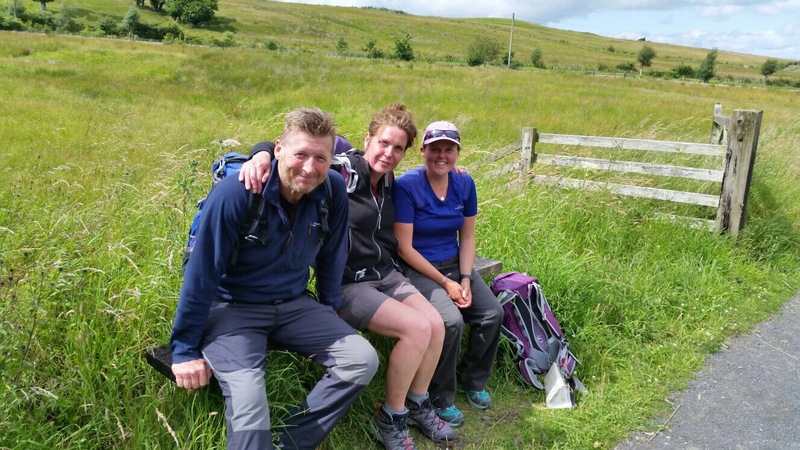 At 3pm Ronnie and Julie turned around to walk the 12miles back to Garrigill – a 24mile day(!) 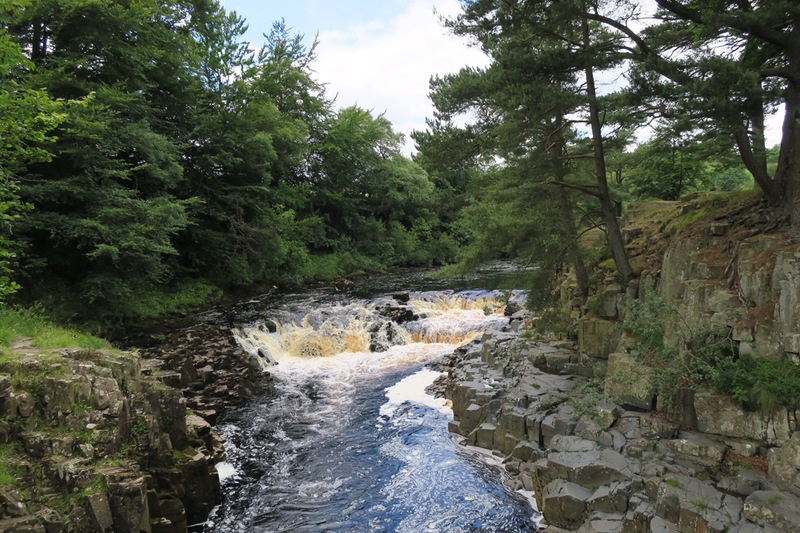 – and I continued to Haltwhistle (a mere 5 extra miles) . Their parting gift was a small plastic pop bottle filled with whiskey, a very thoughtful present.